Burnout is a growing concern among nurses. Long shifts of 12 or more hours can lead to exhaustion and stress. Plus, many nurses are dealing with the emotional strain of dying patients and grieving families. 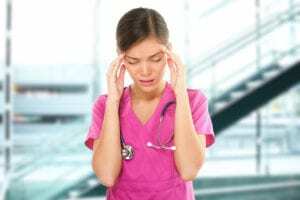 Nurses in high-stress environments, such as hospital emergency departments, may be especially susceptible to burnout. And so are nurses who enter the field with the goal of helping others; they tend to take perceived job-related successes or failure personally. If left untreated, burnout can lead to clinical depression as well as a substance use disorder. This is because many nurses turn to drugs or alcohol to numb the physical, mental and emotional symptoms caused by chronic overwork and a sustained lack of job fulfillment and support. Self-care is a big part of preventing nurse burnout – and this includes eating right, exercising, practicing relaxation strategies and doing your best to strike a healthy work/life balance. And, it goes without saying, that unwinding with drugs or alcohol is never the answer! According to the American Nurses Association, roughly 8 percent of nurses have a substance use disorder – and Seabrook can help. Our specialty track for nurses was developed by nurses specifically to embrace and treat nurses. To learn more, call today: 800-761-7575.